Impossible to Predict! 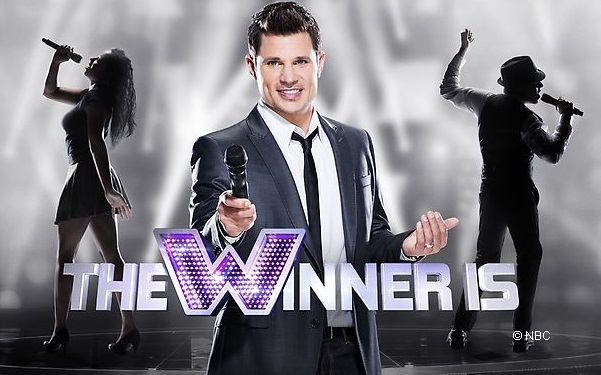 THE WINNER IS – Nick Lachey Interview! Pictured: Nick Lachey on the set of THE WINNER IS with contestants in the back. During a recent press conference, Nick Lachey said he believes that the show is much different from other singing competition shows. “What makes this one so different is it really combines the talent and the great performances of a singing competition show with the game play and the strategy of a game show,” said Lachey. Who are the 101 Judges? Popular television shows that revolve around displaying singers to the world often allow their audience members to vote for their favorite singers, allowing them to determine the winners of each round. “American Idol”, “The Voice”, and “The X Factor” are examples of these shows. 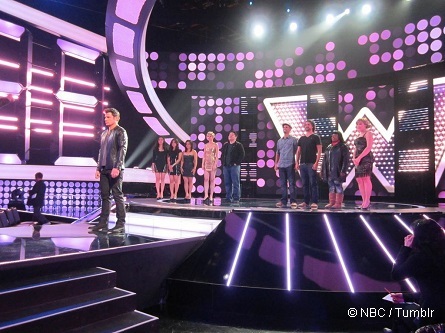 “The Winner Is” will not give viewers a chance to determine who the winner is. There is a mass of judges called “the 101” that consists of bloggers, music critics, music teachers, and producers. They sit-in on every show deciding the winner, which will air, on the seventh and finale episode. “The 101” using a different pool of judges every episode, and they vote on each performance. We spoke to some of the audience members who attended tapings of the show, and some of them were selected to be in the pool of “101 judges.” One particular audience member said that she was chosen three times to be part of the judging panel. More from out Set Report here. Lachey claims there was not a specific way to determine who the judges were voting for, or felt had talent. He said there were some decisions they made he did not agree with, and that “every decision they made, which is I think bit of drama of it. You think you might be able to predict how the 101 is going to vote.” Lachey said there really is no way to predict. The contestants are judged on their talent skills, and performance ability, however they are also judged on how charismatic they are on stage. It is very important they know how to interact with an audience, and exert a high level of stage presence. Lachey also believes the music industry has changed since the 1990’s, when he received his first taste of fame with the pop group 98 Degrees. Back then singers had to make it big the old-fashioned way, by moving to New York or Los Angeles, struggling, and hoping to land a big record deal. Fast-forward to 2013, singers are now utilizing social media to be discovered. Justin Bieber is currently one of the biggest pop stars, and he was discovered when a YouTube video of him singing went viral. Lachey went to a fine arts high school in Cincinnati, Ohio. He quickly left school with his band members and moved to Hollywood. He remembers what is like to be young, and struggle. He believes there were people at his high school that were better singers than he was, however they never moved to Los Angeles, or New York in order to pursue it. He said he thinks these singing competitions give people a shot to succeed in the music industry. EXCLUSIVE The Winner Is Set Report here! “The Winner Is” allows these singers to compete repetitively for weeks on national television (if making it to different rounds). Social media allows these people to gain followers, therefore if they do not win the competition they could still walk away with a significant amount of fans. Lachey also believes that song choice is quite vital to the singers moving on to the next round. He said, “Some songs resonate more with judges than others.” On the other hand, a singer could come out and do a completely different version of a song, and blow the judges away. NBC will air six regular episodes with the seventh being the $1 million finale episode.